I have been long fascinated by the American beauty brand Fresh cosmetics, in big part because brand’s founders, Alina Roytberg and Lev Glazman, have their family roots in Russia and that is closely connected to their approach in creating their products and selecting the lead ingredients. My beauty love affair with Fresh products (the brand was launched in 1991 when Fresh Apothecary opened its doors to Boston customers ) started many years ago, when my father brought me one of their beautifully wrapped soaps (it looked like a mini work of art and was quite pioneering in its packaging) from his trip to New York. Initially I had to rely on occasional treats from US-based friends and was thrilled when Fresh cosmetics concept store opened a few years ago on the Marylebone High Street. I still go there on a regular basis, to satisfy my new product launches curiosity or to stock up on old favourites like perfume Cannabis Santal, Seaberry Restorative Body Cream, Creme Ancienne and Sugar Lip Treatment Sunscreen SPF 15. When I was growing up in Moscow there were hardly any beauty products available to buy in the shops (unless you were lucky enough to have access to a member-only shop called ‘Berezka’/’Birch Tree’, where you could get some cosmetics or if a member of your family worked abroad-more of a rarity than regular occurrence) so many women relied on fresh ingredients like strawberries, honey, sour cream or cucumber to make scrubs or masks in order to keep the skin in top condition and that is the approach that lies at the heart of all Fresh products, whether it’s a soap, beauty product or perfume. One of the latest product launches from Fresh (it was launched in July) is a very welcome treat for the skin that is starting to look dull as cold winds and central heating are starting to take its toll. Fresh Umbrian Clay Mattifying Face exfoliant will not only help to refine skin’s texture but it also promises to balance it with clay. 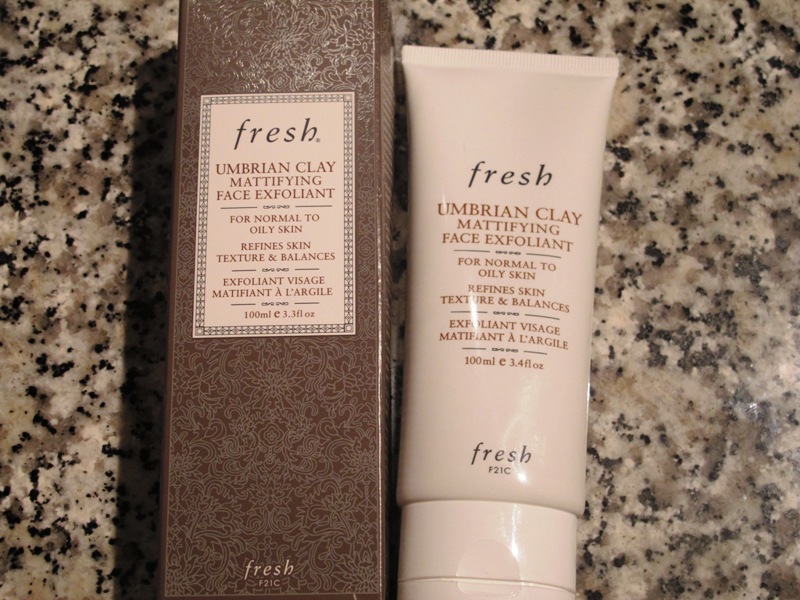 Clay has been known for centuries for its purifying and detoxing qualities but Umbrian Clay has an additional high-mineral content that neutralises acidity, purifies and clarifies your complexion, thus creating a perfect base for serum or moisturiser deeper penetration and more even & lasting make-up application. Lev and Alina first discovered the benefits of Umbrian clay through their Italian friend, who has been suffering from severe acne until she came across pure clay in one of her local herbal stores. Within weeks she noticed a marked difference in her skin. This interesting story led Lev and Alina to a small Italian town of Nocera Umbra, which is the sole source of this naturally occurring clay (it has been used locally for centuries on both face and body). The face exfoliant itself feels like a fusion of a clay mask and a scrub. After you cleanse your face in the evening, apply a one pence-sized dollop of the product to your slightly damp skin and massage it in circular motion all over your face, avoiding the eye area, for about 30 seconds and then rinse it off. The exfoliant itself combines bamboo and olive exfoliants. When you apply it to your face it circular motion it gets rid of the dead skin cells on top of your skin and polishes it, while the clay helps to detox the freshly revealed skin. Meadowsweet extract helps to regulate sebum production thus helping to keep shine under control (very helpful for those of us who have oily skin), while an extract from lemon fruit promotes cell regeneration leading to a more radiant complexion. Another ingredient, olive leaf extract, assists in restoring skin suppleness and helps to fight free- radical damage. You also have camomile flower and lavender water that are well recognised for their soothing and calming properties. This exfoliant’s grains aren’t tiny and you will feel them working as you massage the face, so go easy the first time you try it and then figure out how much pressure you need to apply during the 30 seconds. To be honest I like products that multi-task, as often we are so short on time we feel guilty about pampering ourselves in the sanctuary of our own bathrooms in the evening, when we would rather catch up on a favourite TV show or read a book or magazine before falling asleep, so now I feel no guilt about forgetting to do a face mask, as this product allows me to achieve an effective result in a very short period of time. I use it twice a week but it depends on your skin type and needs, you might use it weekly and find that it works best for your this way. Fresh Umbrian Clay Mattifying Face Exfoliant £24 for 100 mls available in-store or online www.fresh.com The product is made in France.